I’ve written in detail about how we’ve saved serious money since becoming a cable-free family. I regularly get asked by readers how to cut the cord on cable and what are the best cable alternatives for the shows they watch. It makes sense for one big reason. As a society, we spend way too much on cable TV. The average monthly bill comes in at almost $110 per month. That’s just insane! 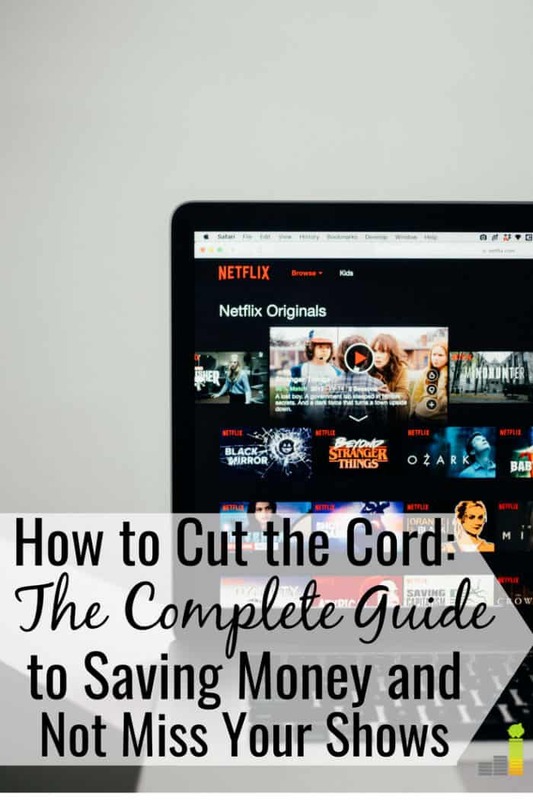 At a time when people are struggling with finances, cutting the cord is one of the simplest ways to save money every month that can be used for other, more important needs. So, if you want to know how to cut the cord on cable, what channels you can get without cable and the best cable TV alternatives to save money, this guide is for you. The first step to canceling cable is the act of cutting the cord. Simple, I know, but a necessary first step. This means, in all likelihood, that you will need to call your cable provider. They may have an early cancellation fee like we faced when we canceled DirecTV. I know the cancellation fee may be a tough pill to swallow. I get it. However, you’ll most likely recoup those savings in a few short months. In our case, we recouped the fee within two months, allowing us to enjoy the savings relatively quickly. One thing to watch out for is the bundle pricing, especially if you have cable through your Internet service provider. They will tell you your rates will go up, which they may. My advice is not to give into their pitches of putting you into some special unadvertised package or promises of an extra $5 or $10 off each month. At some point, the “savings” will be gone and your bill will increase even more. Do the math. 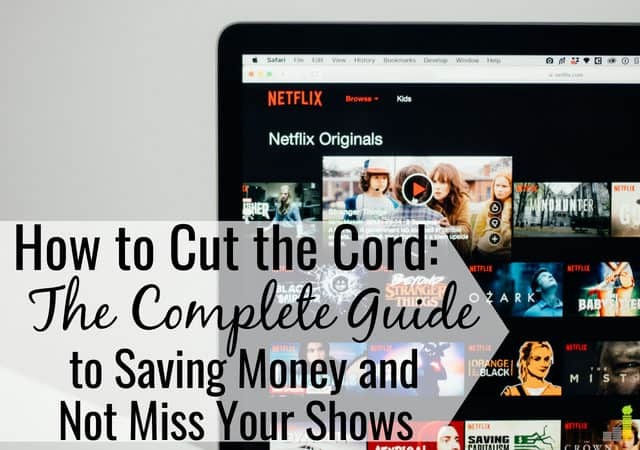 If you still save money without the bundled prices, then it only makes sense to cut the cord for good. Ultimately, they’re going to do all they can to keep you as a cable customer. Check out our guide on how to get Internet without cable if you think you’re overlooking an opportunity to save more money. The cable industry is a slowly dying beast, and they’ll use whatever tricks they can to bind you to them. Don’t give into their tricks! Instead, just calmly tell them you’re done and that you want to cut the cord. Many who ask about how to cut the cord are concerned with getting local channels. It’s not as difficult as you might think, thanks to a digital antenna – which is the first thing you need to buy after you cut the cord. If you want to know how to watch local TV without cable, a digital antenna is the only real way to accomplish that task. Thankfully, a modern digital antenna is nothing like antennas of the past. Most digital antennas are paper thin and can be set up next to your television or adhered to a nearby window. It just depends on what type of antenna you buy. I will mention that you will need one antenna per television. Since we have two TVs, we have two antennas, allowing us to get local channels on both televisions. There are many digital antennas to choose from, and most of them are relatively inexpensive while allowing for TV reception without cable. We have the Mohu Leaf on both TVs and they’ve been great for us. The 1byone antenna and Wsky antenna are other popular options with cord cutters. Here are the best selling digital antennas on Amazon. As you can see, most are relatively inexpensive and should do what you need to get local channels without cable. It is important to remember that a digital antenna will only get you access to local and public access channels. You won’t be able to get cable channels, but thankfully there are other options to get them. Assuming you still want access to cable channels after you cut the cord, you should check out some of the best cable TV alternatives. Thankfully, there plenty of ways to still get cable channels without cable. You just have to find what option works best for your needs and interests. My suggestion is to take advantage of free trials to find the one you like best. Those who are trying to figure out how to cut the cord are often concerned with replacing their favorite cable channels. In this case, you want to find a streaming service that offers cable channels without a contract. Hulu: Hulu is a streaming service similar to Netflix (check out our Netflix vs Hulu guide for an in-depth comparison) that offers access to network and some cable channels. With plans at $6 or $12 per month, it’s relatively inexpensive. The downside is that you have to wait 24 hours after a show originally airs to watch it and many only go five episodes back. If this is an issue for you, there is a new service, Hulu with Live TV, that costs $44.99 per month for 60+ channels and a cloud-based DVR. Hulu Live is the best option to watch ESPN without cable without the hefty price tag. You can check out our Hulu with Live TV review for a full breakdown of the service. Sling TV: Sling TV is one of the more established cable TV replacements and is offered by satellite giant Dish TV. We’ve tried the platform several times the Sling TV packages offer plenty of content to meet the needs of most. Recent additions of a cloud-based DVR and the ability to create your own guide now make them a more attractive option. Sling TV is a cheaper offering, starting at $25 per month. They also allow more customization relative to other services. You can check out our Sling TV review for a full breakdown of the service. Philo: Philo is a relatively new streaming service that has a unique spin – they don’t include sports channels in their offering. While there aren’t any sports channels on Philo, they do have many other popular channels that most want after cutting the cord. At only $16 per month, Philo may be one of the better options to get the shows you want without spending too much money. Philo’s low monthly cost is its strongest selling point. Not having sports available to stream is a big part of how it is able to keep its monthly subscription fee so low. You can still do things like watch HGTV without cable and save considerable money each month. That’s just a partial list! Philo does offer a 46 channel plan that’s only $20 per month. Philo offers a 7-day free trial to check out their platform. Check out our Philo TV review for a full breakdown of the service. FuboTV: FuboTV started as a soccer only offering. They now also offer access to dozens of sports stations like FS1, FS2, BTN and more. It also includes DVR functionality. FuboTV also offers access to live local CBS, Fox and NBC in certain markets. You can check out FuboTV through their free 7-day trial. Playstation VUE: We’ve not tried Playstation VUE but it’s another popular cable TV alternative. You access Playstation VUE through a variety of devices, and it starts out at $30 per month, going up to $65 if you get the premium channels. The nice thing about Playstation VUE is that they offer a cloud DVR and allow five simultaneous streams. DirecTV Now: DirecTV Now is an offering by, you guessed it, DirecTV, but without the nasty contract. We’ve tried DirecTV Now several times, taking advantage of their free trials and were moderately happy with the experience. The downside is that their lowest monthly package is $50 and goes up to over $135, though they do finally have a cloud-based DVR to offer. You can check out our DirecTV Now review for a full breakdown of the service. Amazon Video: Amazon video is the final cable alternative if you want to cut the cord. You don’t need to have Amazon Prime to take advantage of their video content. but it does open it up to quite a bit more offerings and is a good way to watch free streaming movies online. Their movies aren’t always the best, but, like Netflix, they have a lot of original content. If you choose to get Amazon Prime, it is $119 per year, which works out to $9.90 per month. We did have Amazon Prime before cutting the cord on cable so I don’t count it towards our cost as we’d have it anyway. By taking advantage of different free trials, we’ve found that you can replace a lot of what you currently watch with cable. Just remember to do your research before cutting the cord. The problem with all of the above alternatives to cable is that they come with a monthly cost. If you are looking for even bigger savings and a one-time fee, there are some lower cost alternatives to cable that may work for you. With all of these alternatives, you have a relatively low one-time cost as opposed to an ongoing monthly bill. The one thing to keep in mind is that these lower cost options will not replace cable TV channels. They will provide access to a small handful of channels and apps, but they won’t replace everything. Amazon Fire TV Stick: The Fire TV Stick is the go-to device in our home. At only $39, it’s relatively cheap and plugs right into our TV. It provides access to about 25 different apps and channels and allows us to stream services like Netflix, Amazon, or HBO Now. We also like that it’s portable so we can take it with us on vacations. You can check out our Amazon Fire TV Stick review for a full breakdown of the device. Amazon Fire TV: We recently added the Amazon Fire TV to our home and really like the device. The Fire TV is a more amped up version of the TV stick, operating on the same platform but with a cost of $69. It adds Alexa capabilities and considerably more gaming options. You can check out our Amazon Fire TV review for a full breakdown of the device. Roku: We’ve not used Roku but it operates much like the Amazon Fire Stick. The Roku provides access to many of the same apps and channels as the Fire TV Stick does. It’s currently $29 and is also portable. If you want a device with more features and 4K ability, you can get the Roku Streaming Media player for roughly $50. Remember that these will not replace most of the channels you currently watch. However, if you don’t watch much TV and don’t mind streaming a show or two online, then one of the above can be a great option without a monthly cost. I was seriously addicted to our DVR when we had DirecTV. I loved that we could record something, watch it whenever we want, and skip through the commercials. Thankfully, I’ve found that divorcing the DirecTV DVR went quite well. Tivo Roamio:The Tivo Roamio currently runs for $400. It allows you to record up to four shows at once and stores up to 75 hours of content. It works on many platforms and has no monthly service fee. The one downside is you can only record shows you receive via digital antenna. There are cheaper options from Tivo but they require a monthly service charge. Tablo OTA DVR: The Tablo DVR is a bit cheaper, coming in at $250, and it allows you to watch up to four shows as you record them. Tablo does charge a monthly fee, starting at $5 per month, with discounts given for an entire year. From my research, a monthly plan is not required so you may be able to get away without a monthly fee. There are other DVR options but I haven’t researched them enough yet to form an opinion. A common objection to cutting the cord is the fear of losing your favorite channels. We felt the same way before we cut the cord. Not all streaming providers offer the above channels, though many of them offer most of the above. Pick the provider that offers the most channels you want and you’ll likely be happy with the rest. I’ve said this before but I can’t believe it took us as long as it did to cut the cord. Now that we’ve been cable free for over two years, there’s no going back. We’ve saved over $2,000 during that time. That’s money that’s now working to grow our wealth instead of the cable company’s bottom line. When you compare what we pay now to our $105 per month bill with DirecTV, it comes out to a savings of $80+ per month! We do miss some things, but there are so many streaming providers today that it makes sense to cut the cord on cable as you can usually get the content on a different platform. We also have a Fire TV Stick, Fire TV and Mohu Leaf but those were all one-time costs that we recouped long ago. The key to cutting the cord and banking the savings is knowing what you want and keeping the costs to a minimum. It’s easy to lose savings by adding some of the cable TV alternatives. The more you add, the closer you get to the same situation you were in before cutting the cord. Just sit back and think about what you can do with an extra $80 per month. That’s nearly $1,000 per year! That’s money that can be used to pay off debt, save for retirement, save for a vacation or many other things – all of which are much more satisfying than paying to watch something on a magic box. If you have cable, why do you still have it? If you’ve cut the cord, what are some of the tools you’ve used to get your content? What are you doing with your savings after cutting the cord? This is a great post for those looking to cut the cord. I cut the cord almost three years ago when my promotional rate for TV + Internet expired. At that time I also cut my internet service down to a lower speed. When I did that I saved in the neighborhood of $30-40 a month when compared to the promo rate. I now use antennas for both my TVs and also have Roku sticks. I love that I can turn my Netflix and Hulu subscriptions off and on to better fit my budget. I can also do the same with Sling TV, but I’ve also had the same issue with the buffering. Thanks Leah! That’s a great point I hadn’t thought of in turning off your memberships to save money. If you don’t have a need for it over the course of a month that’s a great way to save some money. As you know we cut the cord a few months back and are very happy with the savings. One thing I would add to this article is that the lower cost alternatives like Roku and Fire TV stick appear, to me at least, to be little more than user interfaces to use things like Netflix, Hulu, etc. I think of them as a different category altogether instead of an alternative to Netflix, Hulu, etc. I see your point DC, but I’d disagree as they allow you access to a good number of services. Different than other alternatives, yes, but still viable alternatives in cutting the cord. Thanks for this information, I have been trying to figure out for 5 years how to get rid of my high priced cable/internet/phone bill. I am a senior and I get tired of paying to see shows/movies that I watched 25 to 40 years ago. My contract ends 12/15/2017 and I plan to get rid of cable. I have a smart tv that has the cable alternatives like roku, Netflix, hulu, etc and I’m trying to figure out if I cut both cable bundles (cable & internet) will I be able to use these features? I’m aware that I need internet to use these features but I’m trying to find a non-contract internet provider alternative. Any ideas? Good question Cyn. To my knowledge, you wouldn’t be able to use those features. The one thing to watch out for is if you find a cheaper ISP that they might have slower service – so make sure you check out their speeds before switching. I’ve had direct TV for less than 48 hours and am such of it already. The sales person at Sam’s did not tell us we don’t get free movies like with Dish. He claimed that we would get all of this and more. They are also hard to reach and disconnected me twice while trying to get help. I want my dish back. Sorry to hear about the hassle Carol. Unfortunately, I don’t think Dish isn’t a much better option – both like to give you the runaround and charge way too much. I have read many articles on cord cutters. No one discusses options and speeds required for Internet. I cancelled my cable and my options were up to 75 download for more than Internet plus my cable channels. Or a much cheaper price for up to 10 download speed. I have seen on cord cutters dot com that a good minimum is 20 download speed. What speed Internet is everyone using, who do you use and how much does it cost? That’s a good question Carol & a lot of it goes back to each different option is going to have its own requirements for speed and not something universal, plus other issues. That being said, ours is 42.85 Mbps download speed, 6.13 Mbps upload speed and 90 ms latency which is on the higher end of what is offered by our provider – we need it as we work from home. It runs us about $75 per month and would have it regardless of having or not having cable. Help! I read your article, and am still unsure of what will fit my needs. I want the basic channels still like CBS, ABC, NBC, FOX, etc. and also be able to watch football games from the Oakland Raiders (my husbands team) and the Denver Broncos (my team) as well as some local college football (we live in Kansas). Right now I am paying $155 a month for a bundled cable/internet package (which is ridiculous). What would be the best option for my needs? This is all really confusing to me… Thank you! Hi Amber, it really isn’t that confusing. If I can do it I’m certain you can. 🙂 That said, you’ll want an antenna to get locals – I list some of the best ones in the post. Then, you’ll want to look at either DirecTV Now or Sling TV to get access to cable channels that’ll get you sports and shows you want – they’re both easy to set up and should save you $50+ per month. Hello, trying to help my father cut the cord. When I was a kid we had an antenna on the house and got five fuzzy local channels. What antenna do you suggest when we are over 100 miles away from nearest metropolitan area where the stations are broadcast from. Tried a window antenna in my sons room once and all we got was fuzzy qvc and Christian broadcast network. I assume it was a cheap antenna but if it wouldn’t pick up the stations at all that concerns me. Dad wants the local news and root sports. He already has a fire stick. That’s a good question on the antenna. We’ve had really good service with Mohu Leaf and believe they have some that have that kind of radius. We have recently gone to Amazon Fire TV. I am very green. A problem we are having is with sound when we watch various programs like Downton Abbey. We get a scratcht, cha-cha-cha noise at ghe front end of sentences actors speak and have a hard time understanding what is being said. What do you suggest? Sorry to hear that Bonnie. I’m not certain what it could be, to be honest. It could either be the device, the TV, or the connection between the two – or the episode itself. Sorry not to be of more help. I have Amazon Fire Stick and Spectrum cable. I have setup many channels that I get on Spectrum onto Fire Stick, all free. If I drop cable, would I lose some or all the channels I added to Fire Stick. When adding these channels to Fire Stick, I had to enter codes from Spectrum cable, that’s my concern. It’s very possible you will Robert. Often times they require a login from your cable provider. Sometimes, some channels will allow you to bypass it with the login from your Internet provider. It’s really dependent on the channel and provider. A note on football: Sling or Direct TV have sports channels. They get expensive, and try to lock you in if you fall for the ‘free device promo’ (sling) Fire stick and Apple TV devices have sports apps to which you might subscribe. There is one for football, hockey, tennis, golf even cricket. Your local team could perhaps be picked up by the digital local antenna. We find if reception isn’t great, it’s fun to go to the local pizza place and join the fun there. That is a good point – they both, as well as other providers, offer add-ons that can make them more expensive. I always recommend taking advantage of any available free trial that’s offered so you don’t needlessly lock yourself into something you may find you don’t like. HELP!!!! I LIVE IN NJ AND PAY AROUND $250 a month for bundled cable,internet and phone from COMCAST,which in my opinion, is completely unacceptable. I have a 8 and 6 year old and really only need basic cable with kids channels like Disney etc. I would like nothing more than too tell COMCAST where to put their cable TV but honestly DIRECTV AND DISH which I have already cancelled are NO better. My wife ordered the fire stick which is ok but what about the others? Any suggestions? I’d take a look at DirecTV Now or Sling TV. Both are good replacement options, have no contracts and are a fraction of the cost. Here’s a good post on other options that can help. do I need to hook it up first then contac Direct TV I am paying 200.00 a month, I like Starz and LMN and Hallmark will I be able to get them. The Fire Stick gets you access to a number of apps/channels but to get access to cable channels like that you’ll need to use either DirecTV Now or Sling TV. Either will save you $150+ per month on what you’re currently paying. We have a dish receiver for our camper to use when camping. The Firestick will not work in the camper tv without internet or wifi or what do you suggest? Have you tried a standalone WiFi option to have WiFi accessibility? That should be a good option. Hi John. I have a smartTV, amazon prime, netflix. Would a fire stick be helpful? And I would love to save money — my cable/internet/phone are in a bundle. Any thoughts? Great question Jamie. It could be helpful in two situations. Your Smart TV may not have all the apps you’d want access to and the Fire Stick could expand those apps. The other reason would be if you travel. You can use the Fire Stick in most any Smart TVs. We take ours with us all the time so we can access our apps while on vacation. Good question Joanne. The best we’ve seen, or at least the most we’ve heard about, is Verizon Fios and AT&T U-verse. How much are you currently paying for both internet & cable? So, I’ve been wanting to try and save money and have thought about the fire stick. I don’t have internet right now, but I have Directv. I pay about $91 a month. If I have to pay for internet and certain apps I’m not sure if I’ll be saving any money. I do like the option of being able to cancel certain apps for when you don’t need them. We don’t usually watch as much tv during the summer months. I have certain tv shows I like to watch, but I usually dvr them right now because we are usually busy at the time. What do you suggest? That’s a good question Lindsey. If you don’t absolutely need internet service, you may not save money. You can always see what the Internet Service Providers in your area charge and try a free trial of Hulu Live or DirecTV Now to see if that works for you. Sorry but if i get rid of cable, and get the fire tv stick and the mohu leaf 50 will is till be able to get wifi for my ipads and laptop. or do i still have to get the wifi with spectrum or directtv? You would still need to get WiFi for those. You can check out this post on the best ways to get Internet without cable. Is Fox News on any of these? Before we disconnect cable. Hi Sandy, yes, you can get Fox News on Hulu Live. Wow, sorry to hear that Anuel. They definitely like to make it seem like you’re getting a deal, but it’s not. Hulu Live is a great replacement!